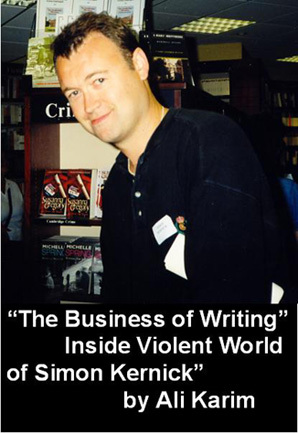 'The Business of Dying' from Transworld/Bantam Press has garnered great reviews from heavy hitters such as Mark Timlin from 'The Independent', George Easter of 'Deadly Pleasures Magazine' as well Mike and I at SHOTS! - The Crime and Mystery Magazine. If you like your crime fiction hard-boiled and set on the mean streets of London, with twisted morality, where sometimes it's hard to discriminate the good guys from the bad, then you've landed in the right place - The Violent World of Simon Kernick. Ali : Simon hello, just to say congratulations on the great reviews for your debut 'The Business of Dying'. Can you tell us a little about the book, for the readers unfamiliar with your work? Simon : Basically it's a detective story but one with a little bit of a difference, as the detective in question, Dennis Milne, is also a hitman on the side. I suppose there are two stories effectively. On one hand it's him committing a hit on three people that he believes are violent drug dealers, when it turns out that they are not criminals, but two customs officers and an accountant. The ramifications of that are that a hunt for him commences. All the while he's involved in case of a murdered prostitute. So the book sees the case through his eyes, but all the while he's also being hunted, so the book, I feel, is pretty fast moving in that respect, and I don’t want to give too much away. Ali : Dennis is a likeable character in a Tom Ripley/Patricia Highsmith kind of way, so what are your thoughts on amoral heroes in crime novels? Simon : Well I'm not one for greatly supporting people that have no redeeming features, like a gruesome serial killer, but funnily enough I read a number of books about hitmen, where they don't seem to have any morally redeeming features. My own preferences are not to write about characters like that. Dennis has some redeeming features so he's not completely bad. I think you can have morally ambiguous characters, but not out and out bad guys as the heroes. Ali : Dennis is deliciously amoral, but has his own code, so could you tell me where Dennis Milne as a character came from? Is he based on a friend of yours? Simon : People have asked if there is any of me in him…laughing…No funnily enough I got the idea for Dennis from talking to friends of mine in the Metropolitan Police, and they had a cynical view, and depressed at the way things were going. I always thought that it would be interesting to write about a corrupt police officer. A book I had written a few years back but never tried to get published had a chapter about two guys waiting to kill a group of drug dealers, and I thought it would be interesting if one of them turned out to be a copper. From that chapter came the seed for 'The Business of Dying'. Originally, I thought I'd make it a short story, but then I decided to make it a novel. I think out of sheer frustration, you could get someone who could be like that. Ali : So what’s your background. What do you do for a living? Simon : I'm writing full-time now thankfully, but for the last ten years I've been an I.T. Salesman, nothing to do with the industry really just an amateur writer. Ali : Have you always been interested in the crime genre? Simon : I've always been a big crime reader. I guess 95% of everything I read has been crime with an emphasis on true crime non-fiction. In terms of authors I like, well Ian Rankin, but I feel I'm most influenced by the American crime writers, such as Lawrence Block, Dennis Lehane, Harlan Coben - the usual guys. I think Lawrence Block is my main influence, as I've read nearly everything he's ever written, which is saying something as he's pretty prolific. Ali: What's next , are you working on a follow-up? Simon : I am, but Dennis is going to be resting for then next couple of books. The next book, yet untitled, is going to be a detective story using a number of minor characters from 'The Business of Dying' in fact it takes place in the same police station but introduces a new detective, who morally is a nicer character than Dennis Milne. I have had some very good feedback about Dennis, that he will be making a come back. Ali : Excellent news. 'The Business of Dying was a great debut, and we wish great success with the book. Simon : Thank you, Ali and to all the SHOTS readers for their support.